Throughout the year, we all have occasions where only the perfect gift will do. 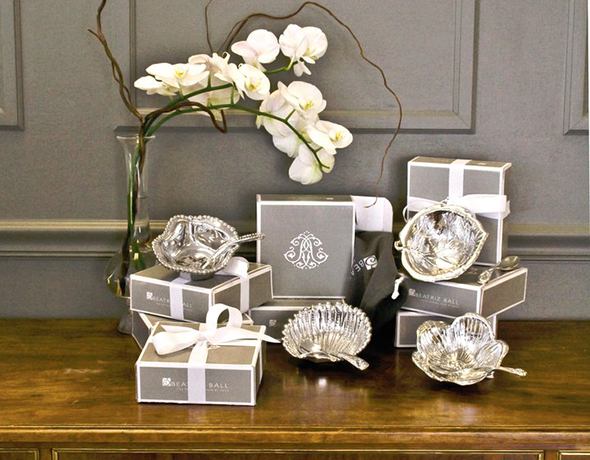 Wm H Diller offers both traditional and contemporary giftware. We showcase our silver from the finest of manufacturers. Experience the glow of polished pewter or the antique patina of brushed pewter. Reproduction Colonial tea sets, Chippendale trays or decorative bowls to complement any decor. A gift made in the USA by Salisbury pewter becomes an heirloom of the future. The Chippendale tray shown features a deep etched hand engraved monogram. Orrefors, Scandinavia’s foremost designer of fine crystal, is a popular choice. Each piece is credited to designers who practice the age old art of glass blowing with a fresh point of view. Featured pieces stand on their own or you can add a personal touch by having a monogram, a favorite quote or even a wedding invitation etched on your selection. The Orrefors collection offers crystal gift ware of the highest quality for any occasion. At Lunares & Beatrizball centuries old traditions and techniques are still kept alive as we march into a more automated world. Sensuous hand made sand cast aluminum brings a sophistication that’s both contemporary and affordable. As our featured items illustrate, the pieces are both functional and lighthearted in design.